The land that lay on the extreme western edge of the World, beyond the Great Sea. In the most ancient times, when the World was lit by the Lamps of the Valar, the land that would become Aman was an empty and nameless region. In those distant days, the Valar dwelt across the Sea in Middle-earth, and the Western lands were apparently uninhabited2. 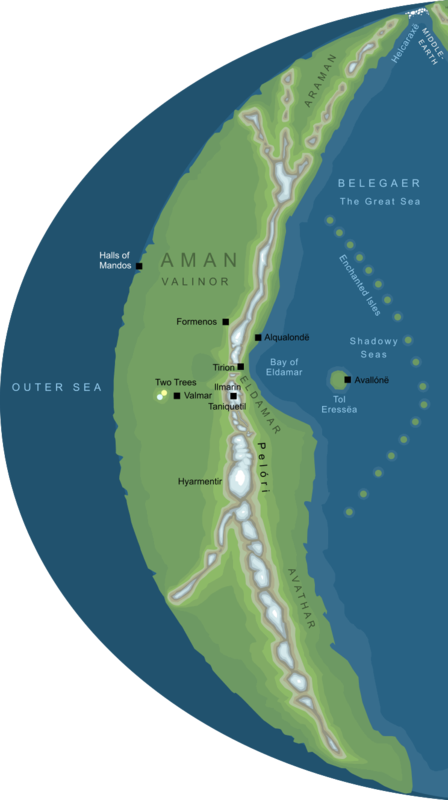 0 With their former home of Almaren destroyed by Melkor, the Valar settle in a new land, Valinor in the West, and the Two Trees are made to bring Light to Aman. 10,396 Oromë discovers the Elves in Middle-earth. He remains with them for roughly a decade, and then brings report back to the other Valar in Aman. 10,444 Fearing for the safety of the Elves, the Valar assault Melkor in Utumno. The resulting Battle of the Powers rages for nearly a century, until finally Melkor is captured and taken back to Aman as a prisoner. 10,856 The Noldor and the Vanyar are brought to Aman. The Teleri delay in Beleriand for a time, but many of them later cross the Sea themselves and dwell on Tol Eressëa. 13,415 After three ages of imprisonment, Melkor is released from the Halls of Mandos. 13,894 Fëanor completes the making of the three Silmarils. 14,325 Having fled from Valinor, Melkor allies himself with Ungoliant and together they destroy the Two Trees and plunge Aman into darkness. Melkor steals the Silmarils and escapes into Middle-earth. Fëanor leads many of the Noldor in pursuit. 14,373 The Moon first rises from Aman as the Noldor complete their journey into Middle-earth, and the Sun rises shortly afterwards. So the Years of the Sun begin in Arda. Meanwhile the ways to Aman are hidden behind Enchanted Isles and Shadowy Seas. I 542 Eärendil comes to Aman to plead for mercy and aid from the Valar. The War of Wrath is launched, and Morgoth is defeated and cast out of the World, bringing the First Age to a close. II 3319 Ar-Pharazôn of Númenor brings a great fleet against Aman, seeking to conquer the Undying Lands for himself. The fleet, and the land of Númenor itself, are swallowed by the Sea, and the nature of the World is changed so that Aman can no longer be reached by mortal mariners. c. III 1000 Five emissaries are sent from Aman to aid the peoples of Middle-earth in their struggle against the Shadow. These emissaries come to be known as the Istari or Wizards. III 3021 After the War of the Ring and the defeat of Sauron, the White Ship returns to Aman carrying the Keepers of the Three Rings, as well as the Ring-bearers Bilbo and Frodo. These dates are compiled from various sources, but especially the Annals of Aman and the Grey Annals in volumes 10 and 11, respectively, of The History of Middle-earth. The dates given in those sources are in 'Valian Years', but are converted here to normal solar years. So, for dates before the Return of the Noldor to Middle-earth, dates are shown as years since the foundation of Valinor. Melkor overthrew the Lamps of the Valar and Almaren, the dwelling of the Valar in Middle-earth, was destroyed. The Valar therefore chose a new land to make their home, one where they would be safe from Melkor: a distant land on the western edge of the World, which became known as Aman ('the Blessed') because of their presence. They raised a mountain-fence, the Pelóri, along Aman's eastern borders, and behind those Mountains of Defence they founded the land of Valinor, and built the city of Valmar. From a green mound westward of that city, Yavanna brought forth two Trees of light: Telperion and Laurelin, the White Tree and the Golden, to bring light to the West in place of the destroyed Lamps. So Aman was filled with shimmering silver and golden light, while Middle-earth lay dark under the stars. Valinor lay in the central parts of Aman, but to the north and south great arms of land curved eastward, away from the light of the Two Trees. To the south, the long shores of Avathar, empty and dark, led away from the land of Valar. To the north, eastward beyond the Pelóri, the plains of Araman stretched into the cold north. At its most northerly reach, Aman came close to the northern margins of Middle-earth, and the two lands were separated only by a frozen region of crashing ice known as the Helcaraxë. At this time, the only speaking peoples in Arda were the Valar and their kind, including those lesser Ainur who had accompanied them into the World, and dwelt with them in Aman. That changed when the Elder Children of Ilúvatar - the Elves - awoke in Cuiviénen, a land in the distant east of Middle-earth. They were discovered there by the Vala Oromë, who brought report of their coming back to his peers in Aman. The Valar gathered at the Máhanaxar to decide the fate of the newly awakened Elves, and their choice would shape the fate of Aman and of the World. Finally resolved to overcome Melkor, the Valar launched the Battle of the Powers, in which the Dark Lord's northern stronghold of Utumno was destroyed, and he himself taken captive back to Aman. Through Oromë, the Valar offered the Elves a home of their own beyond the Sea, and at this time the lineage of the Elves split into two: the Eldar who accepted the summons to Aman, and the Avari who refused it. The great westward journey was long and hard, and many of the Eldar fell away from it, but at last the Vanyar, Noldor and many of the Teleri reached Aman. These were collectively known as the Calaquendi (Elves who had seen the Light of the Two Trees or the Amanyar (those of Aman)3. The ages that followed are known as the Days of Bliss in Aman: Melkor was bound in Mandos, and the Valar and Eldar dwelt in peace in the Light of the Two Trees. After three ages had passed, the term of Melkor's imprisonment came to an end, and he was released. He claimed to be reformed, but he set about creating a web of lies and deceits among the Elves that led to violence and betrayal until he was discovered and fled from Valinor. In the mountains to the south of Aman Melkor discovered the monstrous being Ungoliant, and together they invaded Valinor and destroyed the Two Trees, and then fled from Aman to Middle-earth. When the Light of the Trees failed, Aman was plunged into darkness. The only hope for the rebirth of the Trees lay in the Silmarils of Fëanor, but Fëanor refused to break them. Soon afterwards, it was learned that Melkor had stolen those Jewels and taken them with him to Middle-earth. In madness and grief (for Melkor had also slain his father Finwë) Fëanor assembled the Noldor and led a great part of them out of Aman in pursuit of the Dark Lord. So desperate were they that they spilled the blood of their kin among the Teleri and stole their ships from the haven at Alqualondë. As the Noldor passed into the far north, Manwë sent a herald to them in a final attempt to bring them back to Valinor. It was said to be Mandos himself who delivered the Prophecy of the North, a dreadful foretelling of the ultimate doom of the Noldor if they left Aman behind. At that prophecy, Fëanor's half-brother Finarfin abandoned the march, and returned with many of his people to Valinor, where he ruled over those few of the Noldor who remained in Aman. Meanwhile Fëanor led the rest of the host into the far north, where they crossed out of Aman into Middle-earth. After the departure of the Noldor, the Valar attempted to rekindle the Two Trees. Their attempts failed, but before the Trees died they produced a brilliant silver flower and a golden fruit. Setting these in vessels, and placing each in the hands of a Maia, they set these aloft and sent them into the sky from Aman: thus the Moon and the Sun first rose in the West. With Melkor free in the World once more, the Valar set about securing Aman against further attack. The mighty mountains of the Pelóri were raised to even greater heights, so that a towering wall of sheer cliffs ran along the coastlands of Aman. In that time the Valar also set a chain of dark rocks in the Great Sea to enmesh mariners in enchantment. So Aman was hidden from those in Middle-earth, and the Powers remained behind the Mountains of Aman as the Years of the Sun began. After this time, the Valar remained in Aman for the most part, and little is known of their doings. Ulmo the Lord of Waters gave greater aid than his peers to the Elves, and to those Men who were their allies (the first Men awoke as the Sun first rose). Ulmo sent wisdom and warnings through the waters of the World, and it was through his guidance that Tuor came to Gondolin, and thus that Tuor's son Eärendil was born there. Tuor himself set out into the West with his bride Idril, and legend said that they came to Aman where Tuor was accepted into the race of the Eldar, alone of all Mortals. The wisest in Middle-earth had long seen that the only hope of overcoming Morgoth would be to summon the aid of the Valar from Aman. Indeed, Turgon had sent out many vessels to seek a way through the Shadowy Seas and plead for the aid of the Lords of the West. All of these failed, but Eärendil became determined to succeed, though his first attempts to voyage into the West were confounded, just as the attempts of Turgon's mariners had been. On his last voyage, though, his wife Elwing came to him bearing a Silmaril, and through the power of that Jewel, he was able to pass the enchantments and snares of the Valar and reach the shores of Aman. Once there, Eärendil journeyed through the Calacirya and explored the city of Tirion - which was deserted for a festival - before encountering Eönwë the herald of Manwë. Eönwë brought him before the Valar, and there Eärendil asked for mercy for the Elves and Men of Middle-earth, and forgiveness for the Noldor who had exiled themselves from Aman. The Valar answered his prayer, and a vast army left Aman under the command of Eönwë. In the North of Middle-earth, they assaulted and destroyed Angband, and captured Morgoth. Binding him with the chain Angainor, they brought him back to Aman for judgement, and this time the Valar showed him no mercy. He was cast out of the World through the Door of Night, to remain in the Void beyond. As the Second Age dawned, the North and West of Middle-earth had been laid waste by the force of the War of Wrath. Though Morgoth had been cast out of the World, Sauron had not returned for judgement by the Powers, and remained hidden in Middle-earth. Close to the eastern coasts of Aman, within sight of Eressëa, a new kingdom was made for the Edain, and they settled there to become the first of the Dúnedain, the Men of Númenor. Close as Númenor was to Aman, the Valar foresaw that Men would be tempted by the Undying Lands, and set on Ban on the Númenóreans to prevent them sailing there. There was no ban on the Elves visiting Númenor, however, and the Eldar of Aman would sail across the Sea to visit the Númenóreans throughout the early centuries of the Second Age. As the Age passed, a great part of the Númenóreans fell away from the friendship of the Elves, and began to envy those who dwelt in the Blessed Realm. Aware of the danger, the Valar sent emissaries to explain the Ban, but their arguments did little to change Men's minds. In the reign of Númenor's last King, the mighty Ar-Pharazôn, Sauron was captured in Middle-earth and brought to the island. The Dark Lord set about corrupting the Númenóreans, falsely claiming that those who dwelt in the Undying Lands - even Mortal Men - could claim eternal life for themselves. Convinced by Sauron's lies, Ar-Pharazôn assembled a vast fleet, and set out to conquer Aman for himself. His armies reached the shorelands of Eldamar beneath Taniquetil, and marched into the Calacirya, where they camped around the city of Tirion. Manwë called on Ilúvatar for aid, and the great armies of Ar-Pharazôn were buried, and trapped beneath the earth, where legend says they will remain until the end of the World. At that time Ilúvatar wrought great changes in the geography of Arda. Númenor sank beneath the waves of the Sea, and to prevent any possible repetition of Ar-Pharazôn's folly, Aman was taken away from the World altogether. New lands were created in its place, and mortal mariners travelling into the West would reach those lands instead of Aman. The Elves, though, could still travel a Straight Road from Middle-earth and return into the true West to reach and dwell in the Blessed Realm. After the end of the Second Age, Aman slipped out of the knowledge of the peoples of Middle-earth, and so almost nothing is known of events there after this time. History had taught the Valar that direct interference in the lives of Elves or Men tended to cause ruin and tragedy, and so the rulers of Aman made little attempt to influence events outside their realm during the Third Age. They did not abandon the Outer Lands altogether, but instead adopted a more cautious policy. When the darkness began to fall on Middle-earth once again, Manwë called a council in Aman, and there five of the Maiar were selected to travel across the Sea as emissaries of the Valar, to help combat the evil that was re-emerging there. These five took the forms of Men, and were forbidden to show their true power, but instead were given the task of guiding and advising the peoples east of the Great Sea. In Middle-earth they became known as the Istari or 'Wizards'. Four of these five failed their task in different ways, but one succeeded, helping to vanquish Sauron and returning to Aman some two thousand years after he had left. This was the Maia named Olórin, better known in Middle-earth as 'Gandalf'. It was Gandalf who rallied the forces of the Free Peoples and gave them guidance throughout the years of the Third Age, ultimately bringing about the downfall of Sauron in the War of the Ring. There are hints that some of those in Aman, too, might have also have played a subtle part of their own4. After the end of the Third Age, Gandalf returned to his homeland in Aman with the Keepers of the Three Rings. With them travelled Bilbo and Frodo Baggins, the first Hobbits to make the journey into the West, in recognition for their part in the destruction of Sauron. A few exceptional cases aside, the way into the West remained closed to mortals, though it is rumoured that Gimli the Dwarf, as a fast friend of Legolas and a Companion of the Ring, was permitted to travel there years later, and so was Frodo's faithful comrade Samwise Gamgee. Though we know for sure that the name Aman referred to a land or region in the Uttermost West beyond the Great Sea, narrowing down exactly what's meant by the name can be surprisingly tricky. The precise meaning seems to vary, carrying at least two different meanings in different contexts, and possibly more. In some cases, it refers to the entire Western continent of which Valinor and Eldamar were a part, but in other cases it has a narrower meaning, and only refers to certain parts of that continent. This strait was far, far to the north of the inhabited lands of Aman, so clearly the name is used here for the entire Western landmass, rather than just the lands of the Valar or Elves who lived there. This refers to Ungoliant lurking in Avathar, to the south of Valinor but very definitely on the same continent, and yet 'Aman' is a separate land here. The point is underlined by the name Araman, the name of a region to the north of Valinor but again on the same continent, which means 'outside Aman'. While this is unmistakably a reference to 'Aman' as an approximate equivalent of 'Valinor', Tolkien's use of the word 'chiefly' demonstrates that he was aware of the inconsistent application of the name. This kind of ambiguous naming isn't unknown in the real world, either: for example, 'America' is properly the name of a continent, but the name is also often used just to refer to the country of the United States. As in the real world, understanding exactly what's meant by 'Aman' depends on the name's particular context. The map of Aman shown here is based on Maps IV and (especially) V reproduced by Christopher Tolkien in volume 4 of The History of Middle-earth. These maps belong to an early phase of Tolkien's mythology, and in a few cases the nomenclature of the originals has been updated (for example, Map V refers to the region known in the published Silmarillion as Avathar by its older name Arvalin). It is not impossible that Ungoliant may have dwelt in the West before the Valar came there, though what little evidence we have seems to suggest that she was tempted there by the light of the Two Trees, and hence arrived after Valinor was founded. Ungoliant's existence means that we can't rule out other strange beings of similar kind dwelling in Aman in the deeps of time, but we have no direct evidence of any inhabitation before the coming of the Valar. To be strictly accurate, the terms Calaquendi and Amanyar are not precisely equivalent; there was a single Elf who belonged to the Calaquendi but not the Amanyar. This was Elu Thingol, who had journeyed to Aman as an ambassador before the Great Journey, and had thus seen the Light of the Two Trees, but who ultimately remained in Middle-earth. For example, after Sauron shrouded the Pelennor Fields in gloom on the Dawnless Day, a wind from the West rose up that dispelled his clouds of darkness. That wind is never explained, but it's made clear that it wasn't expected by Sauron, hinting that it was sent by Manwë (whose special province was the winds and airs of Arda).